This boy could be the bargain of the year! 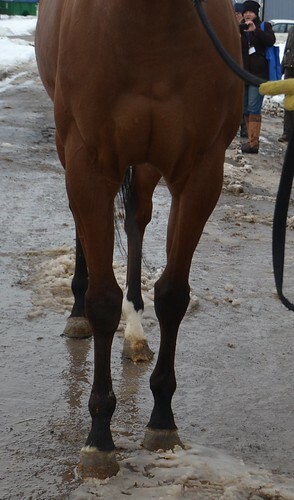 When Cat’s trainer asked us to list him, his trainer stated he was “the best looking horse he’s had”. He has a correct, uphill build and a kind, intelligent eye. 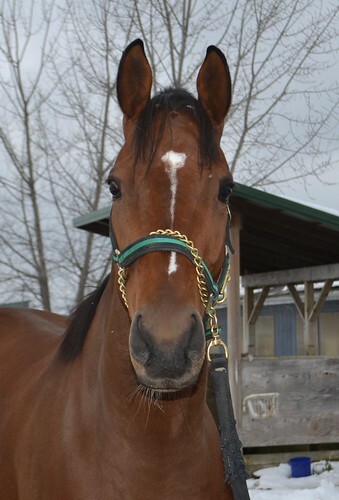 His trainer reports that he has no soundness issues, but is not showing the same enthusiasm for racing as he once did, so he would like to retire him onto a second career. He was perfectly behaved in the bitter cold and wind despite being cooped up for two days due to the snow storm. His trainer states that he has a “been there done that” attitude and has no stall vices. 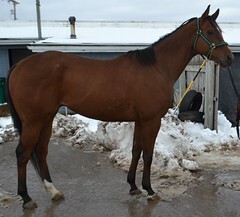 He has been a good racehorse for his connections earning over $116,000 in his 55 starts with 3 wins, 5 seconds, and 15 thirds. We think he would be a fabulous addition to the “Team Warhorse” for RRP 2019! He is well bred by Colonel John (a Tiznow son) out of Tiffany Twisted (by Thunder Gulch), which makes him a half brother to Twisted Tom, who ran in the Belmont last year and won the New York Derby. Cat’s Landing and his trainer were both tentative trying to jog in the snow and slush but we watched a video of a couple of his winning races, and saw a really good mover, with a fluid gallop and a light tort with excellent reach. We have a feeling this handsome boy will sell quickly, so call quickly if he ticks all the boxes for you.